Sheffield United beat Reading to go sixth in the Championship and increase pressure on Royals manager Jaap Stam. Leon Clarke crossed for Billy Sharp to open the scoring with a rebound off Vito Mannone before Mark Duffy cut inside and smashed into the top corner. Omar Richards hammered in a rebound to make it 2-1 before Blades keeper Simon Moore saved Leandro Bacuna's penalty. Sharp sidefooted in from a long ball as the Blades moved above Bristol City and into the play-off places. The game hinged on two second-half minutes with United's substitute goalkeeper Moore pushing away Bacuna's low spot-kick after Liam Kelly was bundled over. Having been close to making it 2-2, Reading instead found themselves 3-1 behind a minute later when Sharp latched onto John Fleck's pass to score via the inside of the post. 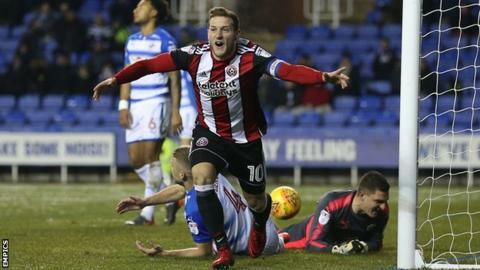 The striker's second goal of the game ensured a fifth Championship game without a win for Stam, whose side are 18th, four points above the relegation zone. In truth the margin of victory could have been greater, with Clarke, Sharp and Clayton Donaldson all spurning good chances for the Blades, who moved a point above Bristol City. Moore was on the pitch because of an injury to Jamal Blackman, while Clarke was replaced by Donaldson after both players were injured in separate incidents the same first-half minute. "It could've been six or seven to be honest. If you're not starting games well enough defending decisively and aggressively, you'll give the opposition chances. "We could've gone forward quicker earlier on, but that didn't happen and we didn't make those decisions." On his future in the job: "I don't feel pressure myself as everyone knows what can happen in football. "If the club wants to make a decision then they can do that. Everyone knows if you're having a bad spell and not winning games, a decision can be made. "That's not up to me, it's how it goes in football. I wouldn't be surprised if that decision comes." "It was a really good performance from the players today. Everything we asked for and everything we expect, we got. "We were all really disappointed with the performance [in the previous game against Hull]. The standards have been set by the players so when we drop below them it's only right they know - and tonight was the perfect way to answer them. "In the first half we should have been 3-0 up after 15 minutes, but it's good that we're creating." Match ends, Reading 1, Sheffield United 3. Second Half ends, Reading 1, Sheffield United 3. Offside, Sheffield United. Enda Stevens tries a through ball, but Clayton Donaldson is caught offside. Attempt missed. Jón Dadi Bödvarsson (Reading) right footed shot from a difficult angle on the left is close, but misses to the left following a corner. Corner, Reading. Conceded by Lee Evans. Clayton Donaldson (Sheffield United) is shown the yellow card. Foul by Clayton Donaldson (Sheffield United). Substitution, Sheffield United. Ryan Leonard replaces Mark Duffy because of an injury. Attempt missed. Chris Martin (Reading) right footed shot from the centre of the box is close, but misses to the left. Assisted by Liam Kelly. Attempt blocked. Sam Smith (Reading) left footed shot from the right side of the box is blocked. Assisted by Liam Kelly. Attempt blocked. Sam Smith (Reading) left footed shot from the centre of the box is blocked. Attempt missed. John Fleck (Sheffield United) right footed shot from the centre of the box misses to the right. Assisted by Clayton Donaldson. Attempt missed. Clayton Donaldson (Sheffield United) header from the centre of the box is close, but misses to the right. Assisted by John Fleck with a cross following a set piece situation. Attempt missed. Clayton Donaldson (Sheffield United) right footed shot from the left side of the box is close, but misses to the right. Substitution, Reading. Sam Smith replaces Tiago Ilori. Jón Dadi Bödvarsson (Reading) wins a free kick on the left wing. Pelle Clement (Reading) is shown the yellow card for a bad foul. Substitution, Reading. George Evans replaces Leandro Bacuna. Attempt missed. Clayton Donaldson (Sheffield United) right footed shot from the left side of the six yard box is close, but misses to the left. Assisted by Jack O'Connell with a cross. Vito Mannone (Reading) is shown the yellow card. Goal! Reading 1, Sheffield United 3. Billy Sharp (Sheffield United) right footed shot from the centre of the box to the bottom left corner. Assisted by John Fleck with a through ball. Attempt blocked. Leandro Bacuna (Reading) right footed shot from outside the box is blocked. Assisted by Pelle Clement. Penalty saved! Leandro Bacuna (Reading) fails to capitalise on this great opportunity, right footed shot saved in the bottom left corner. Penalty Reading. Liam Kelly draws a foul in the penalty area. Penalty conceded by Richard Stearman (Sheffield United) after a foul in the penalty area. Attempt saved. George Baldock (Sheffield United) right footed shot from the centre of the box is saved in the bottom left corner. Assisted by Billy Sharp.